Live events and conferences are held for different reasons, across different industry sectors, they vary in size and attendee numbers and are run in locations and venues all over the world. However, one thing that they will all have in common is their need to design and build a stage and set that captures the essence of their business and delivers an engaging experience to their audience. Here are some of the staples to consider when requesting a stage and set design from your audio visual production company. When liaising with an AV partner about the design of the stage and set for your event it is important to keep in mind how the space will be used and by who. It’s also important to consider the way in which you want your audience to see and interact with the equipment or individuals that will populate the stage and set during the course of the event. 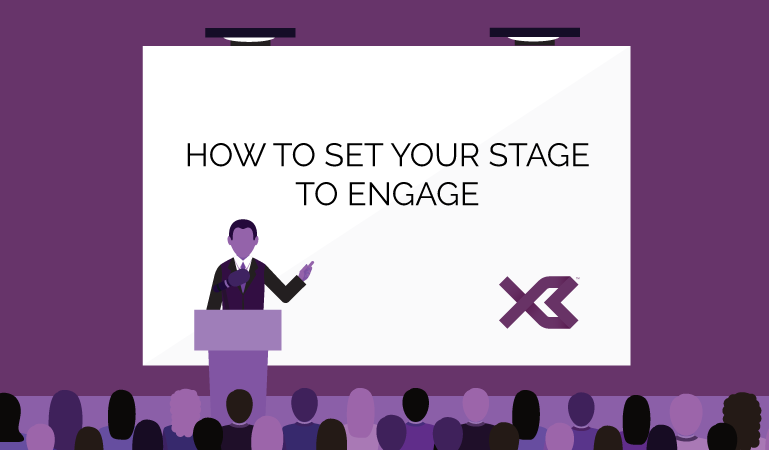 Establishing these key points will help shape the design concepts for the staging, providing a final solution that will be fit for purpose and which will allow attendees to know where their attention should be focused, so they can engage effectively with the content being presented. The stage and set for your event can set a scene and tell the story of your brand. This is why it’s important to select a colour scheme that will complement your branding, but also align with the overall theme of your event. Don’t be shy and get creative, ask your AV supplier what colour schemes will work the best to create the mood and atmosphere you want to achieve in certain points of your event. Once you know what colours you want to incorporate, your AV team can discuss with you the lighting techniques that they can utilise to bring your concept to life. At this point in the process your AV team knows what the focal point for your event needs to be and also what colour theme you want to have translated into your stage and set design. No matter the size or purpose of your event, lighting can transform the look and feel of your venue space and generate an ambience that can help influence how your audience perceives your brand and your messaging. With multiple lighting systems techniques available, trust your AV company to suggest which equipment will render the best solution for your requirements. From uplighters, stage lighting, gobos that can be customised and floodlighting, the possibilities are endless to ensure that your event is lit up in the best way. Audiences are always looking for an experience that captivates them and delivers an impact. This is becoming more achievable with advances in AV technology, including the way in which video content is displayed and integrated within your stage and set design. Video walls and projections not only look spectacular, but they can also help create illusions of space and shapes without physically having to build them into the set design, providing your event staging the opportunity to be flexible and transform to suit various purposes. Combining video displays and pre-recorded content can also bring another dimension to your event and can be a powerful way to present new information to your delegates. An insertion of VTs can help enhance the presentations of speakers, reveal exclusive details, highlight award winner names and can also help break-up what can sometimes be a monotonous stream of people coming on and off stage. Large screens that are clearly visible can also offer a great way to display results of audience interactivity; showing real-time social polls, voting, running live Q&A sessions where participants can express their own opinions as well as see, on-screen, the views and perspectives of other attendees. Video content can also be used in conjunction with lighting and sound components to create an unrivalled effect that can really help to set your brand, message and offering apart. As an event organiser, of course your stage and set design will be guided by your budget. Creating a clear brief and being transparent about your AV budget will help your audio visual team to advise on what can be produced for your financial outlay. Following on from this, AV suppliers such as X3 Solutions can work with your brief to create impressive and bespoke visuals of your staging and set. How? Utilising 3D Rendering Software, X3 Solutions can give you an insight into how your event AV, including the stage and set, could look before any build takes place, allowing your AV production to be specified to the highest quality.